NLCAC wedding jewelry-A special piece (or pieces) of wedding jewelry which is the perfect finishing touch for your bridal look. And for style-savvy brides, it's a fashion-forward way to play with runway trends while still remaining bridal. Need some inspo for your wedding jewelry? ON-STATION NLCAC jewelry-From romantic rose gold to pretty pearls, these are the bridal jewelry trends to watch out for this season. Want to wow your guests when you walk down the aisle? Consider statement-making chandeliers, like those that stunned on the runways. Color Meanings of our design? Love is in the air-and brides everywhere are falling head over heels for rose gold. This romantic rosy hue is the most popular metal choice. Striking in its simplicity, the silver tone with clear crystal is at once contemporary and classic in wedding. It is a symbol of pure love and longing for future. Pearls are the quintessential wedding gem, not to mention the perfect complement to soft color palettes. For this season, we're forecasting a cool twist on classic single-pearl studs and necklaces. Just search NLCAC on amazon.com. 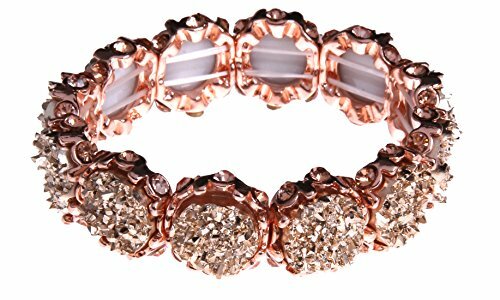 FEATURES: Floral elastic Bridal Bracelet in 2 color of each style. Druzy design or flower options for you to match your wedding dress. SIZE: As our picture show. Style: druzy and shimmering/. Color: rose gold and silver. Material: alloy and acrylic. Weight: about 0.4oz/pcs. Shape: oval or flower. Questions or concerns-No worries, all NLCAC products are fulfilled by Amazon and eligible for 100% free returns for 90 days with no questions asked. There are 4 options in 2 styles-glitter tear drop design. Enjoy a RISK FREE purchase today. AUTHENTIC BRANDED ITEM - NLCAC is an owned and operated only by authorized seller of this original product. Beware of inferior imitations. FIND US-The perfect present for yourself or loved ones, for birthdays, Christmas, anniversaries, and more. Search "NLCAC" to see our complete collection. If you have any questions about this product by NLCAC, contact us by completing and submitting the form below. If you are looking for a specif part number, please include it with your message.